"MY NAME IS SHERLOCK HOLMES. IT IS MY BUSINESS TO KNOW WHAT OTHERS DO NOT." In the dark lurk horrible secrets. Long buried and hidden from prying eyes are the twilight tales of the living and the dead - and those that lie in between. THERE IS A MYSTERY ABOUT THIS WHICH STIMULATES THE IMAGINATION; WHERE THERE IS NO IMAGINATION THERE IS NO HORROR. The stink of a Paris morgue, the curve of a devil's footprint, forbidden pages torn from an infernal tome, madness in a dead woman's stare, a lost voice from beneath the waves and the cold indifference of an insect's feeding - all hold cryptic clues for Sherlock Holmes, the original dark-knight detective, as he drags the hidden horrors kicking and screaming into the light! 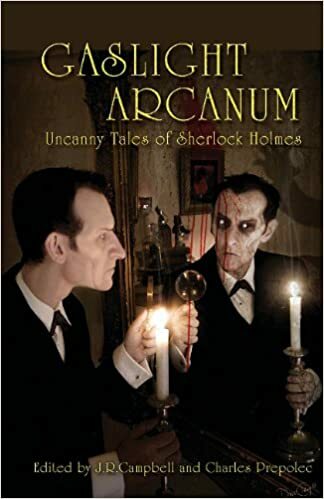 Gaslight Arcanum is the fifth anthology these editors have devoted to Sherlock Holmes' stories. Two previous volumes, Gaslight Grimoire: Fantastic Tales of Sherlock Holmes, and Gaslight Grotesque: Nightmare Tales of Sherlock Holmes also explored the dark-side of Holmes' pastiches.